Almost everyone can benefit from a home office. It provides a convenient place for telecommuters and independent professionals to work at home. A home office provides easy access to work without the typical interruptions of a commercial office. Lack of space is a primary limitation for most people, when it comes to a home office setup. Fortunately, there are a lot of creative options and a spare bedroom is not the only alternative for a great home office. Attics and hallways with a staircase in the center. Simplicity is the key to making a small space work as a home office. Most workstations need only the essentials to function efficiently. Here are 9 ideas for turning a small space at home into a great workspace for almost any kind of project. A Cozy Nook. A cozy nook provides a small but efficient workspace in any room. A built-in desk for office essentials is the only piece of furniture required, apart from a comfortable chair. The ideal built-in contains a large file drawer and several smaller supply drawers. While a ready-made desk may fit the allotted space, a semi-custom cabinet is an affordable way to customize this home office. A Kitchen Niche. A kitchen niche is a cozy nook situated in the kitchen. Located in the heart of the home, it is a great place for a home office. 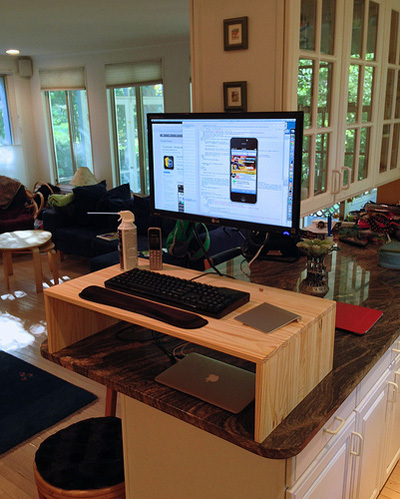 A surface extension that matches the kitchen cabinetry makes an effective workstation. Wall-mounted wire shelving provides a seamless transition with storage boxes in the kitchen color theme. If space permits, an armoire can provide storage for the office and kitchen. A Kitchen Island. A kitchen island can serve as a home office when no kitchen niche exists. It provides a great place for bill-paying, homework and computer use. Drawers and cabinets built into the island offer ample storage for office supplies. Open islands can hide a drop-leaf table that homeowners slide out for meals or deskwork. Note that islands tend to be high enough to warrant a comfortable bar stool for your desk chair. An Attic Hideout. An attic office puts underutilized space to good use. It is often spacious enough such that a long desk against the wall provides enough workspace for two people. Homeowners can easily create the desk by mounting a tabletop to several cabinets. Placed under a window or below a skylight, the work surface gets plenty of illumination. Wall-mount lamps illuminated dark areas and provide task lighting. A Stairway Landing. Since wireless computers eliminate the need for a plug-in modem, a stairway landing makes this underused space ideal for a home office. A landing space work center is easily accessible from any room in the house. File cabinets and free-standing bookcases provide storage for paperwork, supplies and other office essentials. A Closet Workstation. An extra closet easily converts into a home workstation. Removing the closet doors creates a nook that easily houses a desk and wall shelving. Fabric-covered plywood with cork attached makes a stylish bulletin board to hang above the desk. Pendant lamps or other task lights illuminate the workspace, and baseboards that match the room add polish to the space. A Room with a View. A built-in desk under a window creates an office with a view. Alternatively, a windowsill with a custom extension can serve as a desktop, supported by open shelving that ties into the room. Depending on the light and glare, this may not be ideal for a computer desk. However, craft and hobby projects can benefit from the natural light. A Hallway Office. A wall-mounted, drop-leaf table turns a hallway wall into a home office. Re-purposed kitchen canisters and jars make great holders for writing instruments and office supplies. Homeowners can complete the office look with memo boards created from fabric-covered plywood, old radiator covers or small bedsprings. A Two-Sided Desk. A two-sided desk doubles the size of a home office without using more floor space. A bookcase centers the workstation, which houses a small desk on each side. The desk surfaces are attached directly to a bookshelf on either side of the bookcase. A pair of sturdy legs provide support for each desk. Baskets hung on the side of the bookcase provide additional storage. Finding adequate space is one of the most challenging aspects of designing a home office. These ideas can help homeowners “think outside the box” to build the perfect workspace for their office needs. By utilizing unused spaces and re-purposing household objects, they can create a one-of-a-kind office that is stylish and efficient. Richard Campen is owner of Archway Press, Inc., a website with 1000’s of custom house plans and blueprints for garages available for purchase from leading architects across North America. Making Ends Meet; Is it Possible to Make Money Online?